This article was originally published on Aug 10, 2012. We’ve updated it and added this cool new video! Sending spacecraft to Mars is all about precision. It’s about blasting off from Earth with a controlled explosion, launching a robot into space in the direction of the Red Planet, navigating the intervening distance between our two planets, and landing with incredible precision. The first person to ever calculate the distance to Mars was the astronomer Giovanni Cassini, famous for his observations of Saturn. Giovanni made observations of Mars in 1672 from Paris, while his colleague, Jean Richer made the same observation from Cayenne, French Guiana. 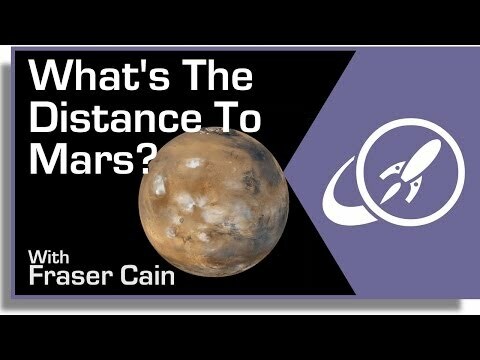 They used the parallax method to calculate the distance to Mars with surprising accuracy. However, astronomers now calculate the distance to objects in the Solar System using the speed of light. They measure the time it takes for signals to reach spacecraft orbiting other planets. They can bounce powerful radar off planets and measure the time it takes for signals to return. This allows them to measure the distance to planets, like Mars, with incredible accuracy. So, how far away is Mars? The answer to that question changes from moment to moment because Earth and Mars are orbiting the Sun. It also requires a little explanation about the orbital mechanics of each. Both Earth and Mars are following elliptical orbits around the Sun, like two cars travelling at different speeds on two different racetracks. Sometimes the planets are close together, and other times they’re on opposite sides of the Sun. And although they get close and far apart, those points depend on where the planets are on their particular orbits. So, the Earth Mars distance is changing from minute to minute. The planets don’t follow circular orbits around the Sun, they’re actually traveling in ellipses. Sometimes they’re at the closest point to the Sun (called perihelion), and other times they’re at the furthest point from the Sun (known as aphelion). To get the closest point between Earth and Mars, you need to imagine a situation where Earth and Mars are located on the same side of the Sun. Furthermore, you want a situation where Earth is at aphelion, at its most distant point from the Sun, and Mars is at perihelion, the closest point to the Sun. When Earth and Mars reach their closest point, this is known as opposition. It’s the time that Mars appears as a bright red star of the sky; one of the brightest objects, rivaling the brightness of Venus or Jupiter. There’s no question Mars is bright and close, you can see it with your own eyes. And theoretically at this point, Mars and Earth will be only 54.6 million kilometers from each other. But here’s the thing, this is just theoretical, since the two planets haven’t been this close to one another in recorded history. The last known closest approach was back in 2003, when Earth and Mars were only 56 million km (or 33.9 million miles) apart. And this was the closest they’d been in 50,000 years. 2018 should be a very good year, with a Mars looking particularly bright and red in the sky. 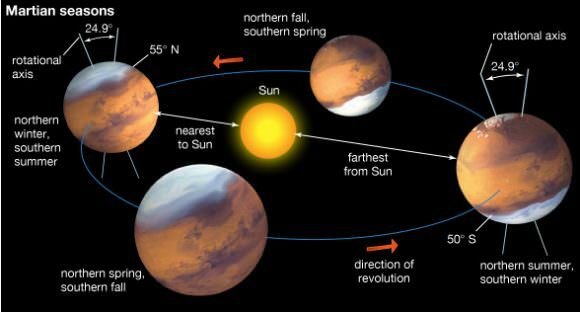 On the opposite end of the scale, Mars and Earth can be 401 million km apart (249 million miles) when they are in opposition and both are at aphelion. The average distance between the two is 225 million km. When Mars and Earth are at their closest, you have your launch window. Mars and Earth reach this closest point to one another approximately every two years. And this is the perfect time to launch a mission to the Red Planet. If you look back at the history of launches to Mars, you’ll notice they tend to launch about every two years. See the trend? Every two years. They’re launching spacecraft when Earth and Mars reach their closest point. Spacecraft don’t launch directly at Mars; that would use up too much fuel. Instead, spacecraft launch towards the point that Mars is going to be in the future. They start at Earth’s orbit, and then raise their orbit until they intersect the orbit of Mars; right when Mars is at that point. The spacecraft can then land on Mars or go into orbit around it. This journey takes about 250 days. With these incredible distances between Earth and Mars, scientists can’t communicate with their spacecraft in real time. Instead, they need to wait for the amount of time it takes for transmissions to travel from Earth to Mars and back again. When Earth and Mars are at their theoretically closest point of 54.6 million km, it would take a signal from Earth about 3 minutes to make the journey, and then another 3 minutes for the signals to get back to Earth. But when they’re at their most distant point, it takes more like 21 minutes to send a signal to Mars, and then another 21 minutes to receive a return message. This is why the spacecraft sent to Mars are highly autonomous. They have computer systems on board that allow them to study their environment and avoid dangerous obstacles completely automatically, without human intervention. The distance from Earth to Mars is the main reason that there has never been a manned flight to the Red Planet. Scientists around the world are working on ways to shorten the trip with the goal of sending a human into Martian orbit within the next decade. We have written many articles about the distance between planets here at Universe Today. Here are the distances between Earth and the Sun, Mercury, Venus, the Moon, Jupiter, Saturn, Uranus, Neptune, and Pluto. And here are Ten Interesting Facts about Planet Mars and How Long Does it Take to Get to Mars? For more information, this website lists every Mars opposition time, from recent past all the way in the far future. You can also use NASA’s Solar System Simulator to see the current position of any object in the Solar System. Finally, if you’d like to learn more about Mars in general, we have done several podcast episodes about Mars at Astronomy Cast. Episode 52: Mars. We have also done an episode explaining distances, Episode 10: Measuring Distance in the Universe. Next PostNext How Do We Learn About An Alien Planet’s Size And Atmosphere?